If you ever happen to come upon a bottle of pomegranate molasses, buy it. And if you ever happen to buy a bottle of pomegranate molasses, you may as well get this book as well. 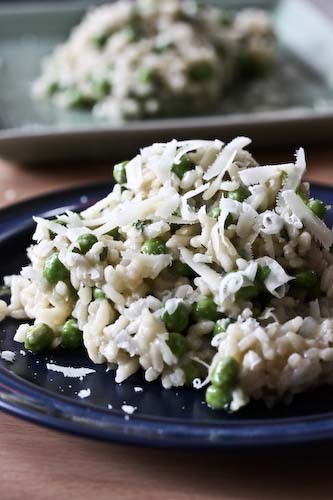 Because if it seems like an obscure ingredient, it's called for over and over in Paula Wolfert's The Cooking of the Eastern Mediterranean and she always puts it to delicious ends. In fact, if every recipe I've blogged from this particular book has called for it, I believe (which probably says more about my choice of recipes, but still). 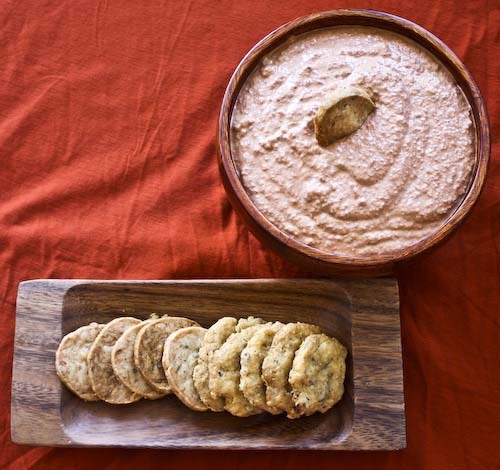 This dip, called muhammara in Arabic (which means brick-colored), is, like hummus and baba ghanoush, a dip of the eastern Mediterranean, although considerably less well-known in the US. Which is too bad, because it's wonderful. Although this particular incarnation comes from Aleppo, Wolfert cites its existence in various forms in Lebanon, Georgia and Turkey. 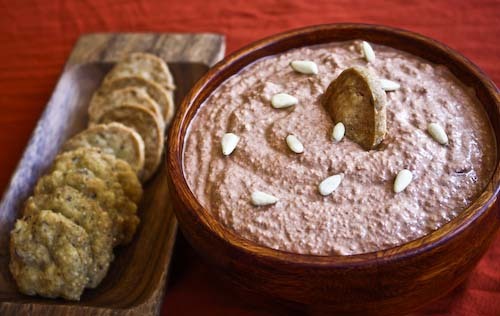 Wonderful with crackers of the homemade variety, it would also be a lovely condiment with meat or fish kabobs or simply with a few grilled pita triangles. I brought it with me to t-gives at a friend's house and it was well received, although now that dinner is over, I have a confession to make. The recipe calls for 1/2 cup wheat crackers and I realized only after I dumped my handful into the food processor that the crackers I had were more like the sweet Digestive than a savory whole-wheat cracker. So my dip was especially hot and sweet but it still help up okay. Next time I'd be a bit more careful on the cracker front. 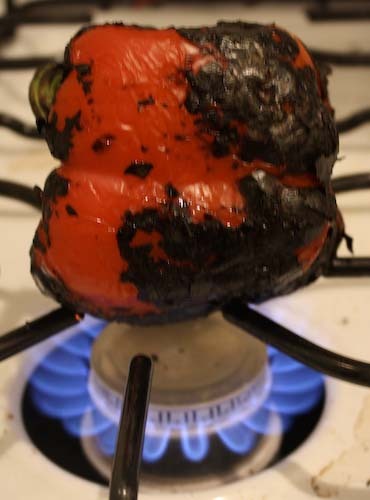 Another note regarding roasting peppers. Some of you may be blessed with a grill or a fire or a camp fire, but I have to make due with an old gas stove. In this case, not such a bad thing because peppers can be roasted right on the burner. Just crank up the flame to high (you'll be okay), place the peppers directly on the grate and watch like a hawk, rotating with tongs. For the smaller chili pepper, it's a good idea to skewer it with a metal or wooden (not plastic) skewer for easy rotation over the flame. It's really very simple. Just be a bit careful and don't get distracted. In a food processor, grind the walnuts, crackers, lemon juice, pomegranate molasses, cumin, salt and sugar until smooth. Add the bell peppers and continue to process. With the machine on add the oil in a thin and steady stream. Refrigerate overnight to allow the flavors to marry. Garnish with pine nuts and a swirl of olive oil. This looks delicious! 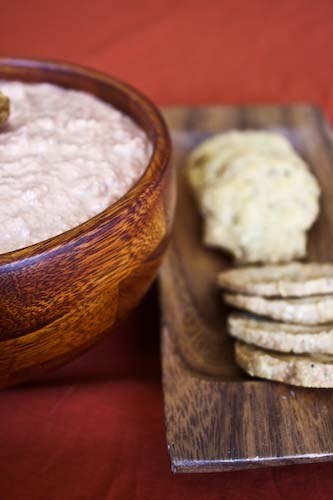 This dip and the Parmesan Thyme Cheddar crackers are going on my list! This sounds beyond fabulous! An absolute must try! The bad part maybe I have to buy the book. I really like middle eastern food so I'll have to try this! Seriously, I can't keep up with the amazing that you're churning out. This seems like a perfect appetizer. If anyone's like me and can't find pomegranate molasses, Simply Recipes has instructions for making it yourself. I really want to try this. I think my bf would really like it too because he loved red pepper dips! I second the recommendation for making pomegranate molasses. Pretty much, you just take pomegranate juice (Trader Joe's is a good source) and cook it down with a little sugar. It's great on salads as well.